Riding gravel and riding on dirt are becoming increasingly popular with many cyclists. Finding a road to ride on that you wouldn't have been able to ride on with a road bike is all apart of the excitement of a gravel bike. A gravel bike allows riders to go places they have always wanted to go but couldn't. The Niner RLT 9 Ultegra Jenson Bike is built for the road less traveled. It features a hydroformed aluminum alloy frame that is lightweight and efficient. The frame features internal shifter routing, thru-axles on the front and rear, and rack mounts on the front and rear. The rack mounts on the front and rear make this bike perfect for commuting and light-duty touring. It has tire clearance for up to 1.75" wide tires and features two inner-triangle bottle mounts on all sizes. The Jenson USA exclusive version of the Niner RLT 9 comes with a Shimano ST-RS685 2x11 shifters and an XT M8000 rear derailleur. The drivetrain comes with an 11-32 tooth cassette and a 34/50 tooth crankset that provides a ton of gearing for climbing while not sacrificing top-end speed. It features Shimano BR-RS505 hydraulic disc brakes that provide exceptional stopping power for longer descents. This is paired with 160mm rotors so riders can have the confidence-inspiring stopping power needed for everyday riding. With Easton EA70 SL disc wheels and Schwalbe X-One tires underneath you as you're cruising along the fire roads, you'll be able to ride endlessly. If you're looking for a gravel bike to help you experience new locations, then you'll love the Niner RLT 9 Ultegra Jenson Bike. I had a 29" hardtail that I had put narrower tires on, this bike is my replacement for it and also an upgrade. I love it so far. 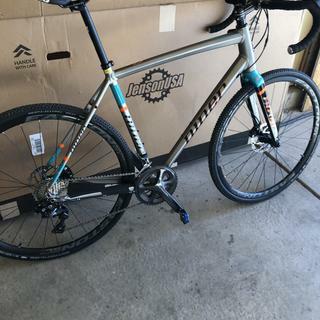 I live in Michigan and our paved roads would qualify as gravel in most states, so having a single bike that can handle broken pavement, potholes, true gravel and smooth pavement is great. I had SRAM double tap shifting on another bike so the Shimano system is taking a little getting use to, but the shifting is smooth. 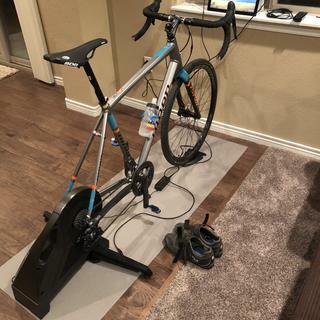 The bars seem a little wide but my other drop bar bike is a track bike I use at the velodrome in Detroit so that's probably just my perception. The stem (100mm) is a little long for me but that's not a criticism of the bike. All in all, it's exactly what I'd hoped for. Came accurately assembled and adjusted, and well packed for shipment. The bicycle was delivered quickly and I was riding the same day. Great service and great experience. What is the weight of this bike in 59cm size? I was looking to buy RLT 9 2-star but I like your build, has the Ultegra, but I'm not an expert. Can you tell me how it compares to the rest of the RLT 9 2-stars components ? What size tire can this bike accommodate? BEST ANSWER: Hey Timothy,Niner claims this bike can accommodate up to 1.75"/45mm tires in the frame. We've often found, with certain tire/rim combos, you can stretch those numbers just a bit in most frames.Keep Pedaling! What's the advantage of the XT rear derailleur here? An Ultegra RD with GS cage would be able to handle the 11-34 cassette as well, right? Can the Shimano drive-train be converted to 1X? I want mineral oil hydraulic brakes but it seems that 1X road is only with SRAM.